No maritime library will be complete without a copy of this volume on its shelves, for the Yorkshire fishing coble and the Yorkshire smack of the past century were among the finest examples of English sea-going craft ever devised, and none more fitted for the rugged coast to which they belonged or for the stormy seas on which they used to sail. 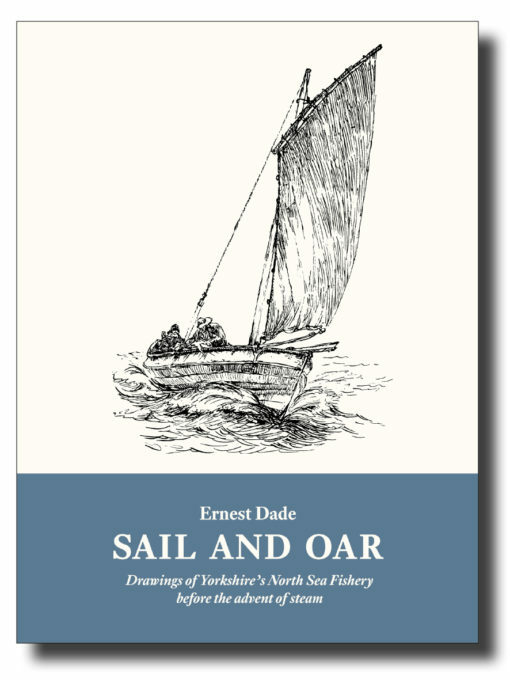 First published in 1933, this book of a hundred of Ernest Dade’s delightful pen and ink sketches of the North Sea fishing fleet in the latter part of the nineteenth century is not only a significant artistic achievement, but also an invaluable historical record. Observed either from his own boat or from onboard the fishing boats themselves, the drawings have an immediacy rare in work of this kind—epitomized by the sketch on page 37 where it may not be too fanciful to imagine that the yawl in the foreground is Dade sailing out to meet the returning fishing fleet with pen and pad to hand. Not only do the sketches portray the boats and their gear accurately and in great detail, but they also show the fishermen at their work both offshore and inshore from most of the fishing centres of the Yorkshire coast. The facility of Dade’s pen work can only be admired and most certainly enjoyed. These pictures show all this and are true in every way. Mr. Ernest Dade lived the life, knew the men, and sailed in the various craft he draws so well. It is a record of things passed away. This new edition has an illustrated Postscript on the restored 40ft Bridlington Sailing Coble Three Brothers. ISBN 978-1-907206-23-8; 216 x 156mm, 224pp, 100 drawings, 4 photographs. Softcover with sewn binding, cover flaps and matt lamination.